On March 16, 2015, Des Moines Waterworks (“DMWW”) filed a Complaint in the Federal District Court for Northern Iowa against several drainage districts in Calhoun, Buena Vista and Sac counties. A total of ten separate counts were alleged. Counts I and II alleged statutory violations of the Clean Water Act (I) and violations of Iowa Code section 455B.186 that prohibits the discharge of pollutants into waters of the state (II). The remaining Counts III-X in the federal complaint alleged claims counts alleged tort-based and constitutional causes of action against the districts: public nuisance (III), statutory nuisance (IV), private nuisance (V), trespass (VI), negligence (VII), takings under the Fifth Amendment (VIII), due process and equal protection under the Fourteenth Amendment (IX), and permanent injunction (X). The claims essentially argued that the drainage districts had polluted the Raccoon River with nitrates and that the nitrates required DMWW to spend large sums of money to remove the nitrates so that the water was suitable for drinking. At the urging of the federal district court, eight counts were certified to the Iowa Supreme Court so that the court could inform the federal district court what its ruling would be on those certified questions. The remaining two counts (I-II) are still awaiting further action in the federal district court. On January 27, 2017 the Supreme Court ruled on all four questions in favor of the drainage districts. The decision was written by Justice Waterman and joined by Justices Mansfield and Zager. Justices Cady and Appel concurred in part and dissented in part. Justices Wiggins and Hecht took no part. Question 1: As a matter of Iowa law, does the doctrine of implied immunity of drainage districts as applied in cases such as Fisher v. Dallas County, 369 N.W.2d 426 (Iowa 1985), grant drainage districts unqualified immunity from all of the damage claims set forth in the complaint (docket no. 2)? Answer: Yes. As explained below, drainage districts have a limited, targeted role—to facilitate the drainage of farmland in order to make it more productive. Accordingly, Iowa law has immunized drainage districts from damages claims for over a century. This immunity was reaffirmed unanimously by our court just over four years ago. Question 2: As a matter of Iowa law, does the doctrine of implied immunity grant drainage districts unqualified immunity from equitable remedies and claims other than mandamus? Answer: Yes. Again, Iowa precedent, reaffirmed unanimously by our court just four years ago, recognizes that drainage districts are immune from injunctive relief claims other than mandamus. Question 3: As a matter of Iowa law, can the plaintiff assert protections afforded by the Iowa Constitution’s inalienable rights, due process, equal protection, and takings clauses against drainage districts as alleged in the complaint? Answer: No. Although these constitutional clauses are fundamental to our freedom in Iowa, they exist to protect citizens against overreaching government. Generally, one subdivision of state government cannot sue another subdivision of state government under these clauses. And even if they could, an increased need to treat nitrates drawn from river water to meet standards for kitchen tap water would not amount to a constitutional violation. Question 4: As a matter of Iowa law, does the plaintiff have a property interest that may be the subject of a claim under the Iowa Constitution’s takings clause as alleged in the complaint? Answer: No, for the reasons discussed in the answer to Question 3. The court’s opinion began by noting that the immunity of drainage districts from money damage claims is based on long-standing case law. “Our cases have consistently held that a drainage district is not susceptible to suit for money damages. It has no corporate existence for that purpose.” The court noted that this has been the law for “over one hundred years.” In lieu of a suit for money damages, the court found that under its case law that mandamus is the proper remedy to adjudicate claims that a drainage district is violating a duty imposed by an Iowa statute. Based on existing law it was clear to the Supreme Court that DMWW’s arguments should be rejected. However, DMWW knew that the existing law was against it when it agreed to certify the questions to the Iowa Supreme Court. Therefore, DMWW argued that the Supreme Court should depart from precedent, citing cases that allow the court to depart from precedent when “continued vitality is questionable.” In response, the Iowa Supreme Court began its analysis by observing that “our prior holdings that the DMWW seeks to overturn were unanimously reaffirmed by our court in 1994 and 2012 without any intervening changes in the law underlying the immunity.” (emphasis supplied). B. There is no reason to depart from precedent. Immunity should not apply in a water pollution case in light of the evolution in the understanding of environmental contamination. The enactment of the home rule amendment to the state constitution in 1978 undermines the rationale for the immunity. The nitrate contamination at issue rebuts the public health rationale for drainage districts. Decisions of other states allowing tort claims against drainage districts. Immunity is unconstitutional as applied. What is interesting about this statement is that it is an argument that the districts have also made in their motion for summary judgment in the federal district court on the first two statutory counts. Even Justice Appel in his partial concurrence (joined in by Justice Cady) noted that “the most valid rationale for the no-money damages approach – that a drainage district has limited powers—is a broad proposition that applies across the board.” A federal judge may be hard-pressed to ignore this unanimous opinion even if that judge considers it to be mere obiter dicta that was not necessary to the court’s conclusion. On the second argument by DMWW asking that the court deviate from existing law, DMWW argued that the enactment of the home rule amendment in 1978 broadened the police powers of county government. The court quickly disposed of this argument noting that “Home rule powers can only be exercised in a manner consistent with acts of the general assembly.” The court also found that “the home rule amendment prohibits local governments from assessing taxes without legislative authorization.” This is an important observation because drainage districts have no innate ability to raise the funds needed to build the nitrate treatment systems that DMWW is demanding. The court obviously recognized this problem. Justice Appel also agreed with this majority holding in his separate opinion. Ultimately, this case is about who pays for nitrate removal from the drinking water that reaches our kitchen faucets. The DMWW does not claim nitrate levels render the Raccoon River unsafe for swimming or fishing. The DMWW does not challenge that estimate. It is for the legislature to decide whether to reallocate the costs of nitrate reduction. The court may be inferring that the Raccoon River’s purpose is not to provide water that is ready to drink and that this is a service that utilities are better positioned to provide. DMWW next argued that a few other state courts have allowed private persons to sue drainage districts in tort. The court quickly rejected this argument finding first that none of those cases involved a suit filed by a water utility or public entity and finding second that Iowa law was unique. Finally, the court addressed DMWW’s various constitutional arguments against drainage district immunity. The court began by citing precedent upholding statutory immunity provisions against equal protection attacks. The court disposed of the “takings claim” by noting that the constitution only protected the taking of private property and that “no private property is involved in this case.” Instead, the Raccoon River was owned by the State of Iowa. The court also rejected the argument that a public utility could be involved in a “proprietary” as opposed to “governmental” function, entitling it to constitutional protection against a taking. The court cited a 1923 U.S. Supreme Court case to support its conclusion that neither the Iowa nor US Constitution protected DMWW from a taking regardless of whether its water activities were a proprietary or governmental function. The court also cited an old Iowa Supreme Court case noting that downstream landowners are not entitled to recover eminent domain payments from a drainage district for harm to private property caused by water flow. The court next nixed DMWW’s argument that district immunity violated its due process. The court reasoned that governmental entities have no right to sue other governmental entities for due process violations. Otherwise, the court observed, tax payers would “foot the bill for both sides.” Justice Appel did not agree with the majority on the question of takings. As noted above, Justice Appel agreed with the majority on several points, namely the unavailability of damages against a district, the inapplicability of the Home Rule statute on drainage districts, and the lack of equal protection, due process and inalienable rights claims attacking what Justice Appel refused to characterize as district “immunity.” Justice Appel did however, conclude that DMWW could raise a takings claim and that nuisance should be available. Justice Appel was joined by Justice Cady in his opinion. Justice Cady issued an additional very short opinion that appeared to be an appeal for legislative action. On December 15, 2015 the Federal District Court for the Eastern District of Louisiana dismissed a lawsuit by Gulf Restoration Network and other not-for-profit environmental organizations. Gulf Restoration Network v. Jackson (E.D. La. December 15, 2016) 12-677 Cross Motions for Summary Judgment post- remand. The case involved a petition by the environmental groups challenging a decision by the EPA not to even make a decision about rule making and asking that the court order the EPA to begin rule making to require numeric water quality standards for portions of the ocean protected by the Clean Water Act but outside the jurisdiction of any state. On remand the District Court, its hands largely tied by the Court of Appeals, had before it a single issue: Was the explanation by the EPA for why it declined to make a necessity determination legally sufficient? The Court looked at the EPA’s argument that it disagreed that federal rule making would be the most effective or practical means of addressing nitrogen/phosphorous problems at that time. Instead, the EPA argued that it would be better to “build on its earlier efforts and to continue to work cooperatively with states” and that the plaintiffs’ proposed rule making was “unprecedented and complex.” Utilizing a “high deference” standard required by Gulf Restoration Network v. McCarthy, 783 F.3d 227 (5th Cir. 2015), the Court agreed with the EPA that its explanation was sufficient. 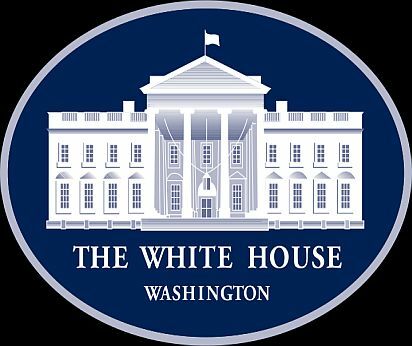 Now that we know we will have a Republican House, Senate, and President beginning in 2017, it is time to consider is what environmental and energy changes might take place during Donald Trump’s first term as President. I am neither supporting nor criticizing the possible actions that a Trump Presidency may entail. Instead, my goal is to lay out a possible roadmap of what may happen on the environmental and energy fronts during the next four years. I must also disclose that I have clients who may be affected adversely or positively by all of the matters discussed below. Rescinding moratoriums on coal leasing. Abolish the Renewable Fuel Standard (“RFS”) which supports the ethanol industry. What will Donald Trump actually focus on and what are the low hanging fruit that he can grab? Waters of the U.S. I think that the elimination of the Waters of the U.S. Rule will be a given. The proposed rule is extremely unpopular among the rural voters that delivered him to power. Rural senators and congressmen have likewise been among his most ardent supporters. Of course, the idea that the proposed rule is a real problem is something of a canard. The underlying law has never been clearly defined despite numerous U.S. Supreme Court decisions and the only way to solve the definitional question of what constitutes a “Waters of the U.S.” is to enact new legislation. I view the chances of an elimination of the Waters of the U.S. Rule as 100%. I see the chance of a more effective definitional solution by Congress at 50%. I’d put the chances of legislation higher were it not for my belief that Congress will continue to show its inability to agree on anything other than recess dates. Wind and Solar. Donald Trump may have to soften his antagonism against wind subsidies to get rural congressional support for legislative changes to the definition of “Waters of the U.S.” I believe that there is only a small chance that existing tax credits will be extended when they expire in 2020 during a Trump term unless there is a grand bargain with Midwest Senators. Solar power may well be the poor stepchild in this trade, though rapid reductions in the manufacturing costs of solar panels and batteries may allow solar to remain competitive regardless. I think that the utility industry has every reason to try to pass federal legislation similar to recent legislative efforts in Florida (failed) and Arizona (succeeded) aimed at preventing alleged “stranded costs” due to the private adoption of solar power. Coal Mining. Resurrecting coal may be a case of too little too late. The biggest bar to coal mining is the Mine Safety and Health Administration on the extraction side, air emission standards for coal fired power plants (Maximum Achievable Control Technology “MACT” rules and Mercury and Air Toxics standards) on the combustion side and coal ash regulations on the disposal side. Without comprehensive new legislation it is unlikely that a President can have much success loosening the rules. Public interest attorneys will simply litigate any attempts at agency leniency. Changes to regulations on the combustion and disposal could make coal-based power more competitive with shale gas, but if President Trump has his way with the expansion of natural gas extraction then coal prices will be trying to meet a moving target. I think it is unlikely that a Trump Administration will be able to do much to resurrect the coal industry to its former strength. Competitively priced energy sources are just too abundant after eight years of incentives and expansion of natural gas production is likely to make new coal mining investment very challenging. Coal Fired Power Plants. Even if costly safety rules are relaxed and the cost of extracting coal goes down, it is also worth noting that it is practically too late to stop the shuttering of many coal fired power plants. Two hundred and forty two plants have been retired or are being retired. Also, what do you do to create a level playing field for utilities that have already invested billions of dollars in upgrading the remaining newer plants? There could be modest improvements in utility costs through legislative changes, but it is hard to know what other special interests may get in the way of definitive legislative changes. That said, there is really little outside of a Senate minority standing in the way of passing some legislation attacking MACT and air toxics standards, so I give some changes to those laws a 25% chance of passage. Those rules probably account for a majority of the spending by industry (either directly or through utility costs) that are related to environmental compliance (said to be $10 billion per year). Paris Climate Deal. Ignored for now and terminated in three years. 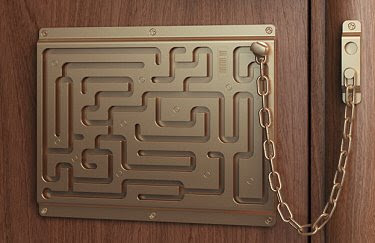 Unlocking Federal Lands. I think that there will be overwhelming support in Congress to force the federal agencies to make federal lands available for energy extraction. This will likely help fuel the boom in well construction, fracking, and pipeline construction in the U.S. I fully expect at least some statutory roadblocks to unlocking federal lands for energy exploitation to be removed with heavy support from the western governors and senators. Even if Donald Trump stalls out in his effort to enact a legislative agenda, Presidents wield enourmous power if they want to expand or contract agency action. They can starve agencies of employees and funds and slow walk regulatory changes or aggressively enforce even minor alleged violations or rewrite rules to the extreme limits (or past) what the legislative drafters intended. It is also quite likely that we will see unforeseen fractures in the political landscape as new allies are formed and old alliances are torn apart. James Pray has more than thirty years of experience assisting industry with environmental compliance issues, including industrial and municipal wastewater permitting, air permitting, RCRA and Superfund cleanups, brownfields development, wetlands, contaminated site cleanups, infrastructure development, renewable fuels, and wind and solar power development, regulation and construction. He is a frequent speaker on environmental topics and has litigated environmental and energy issues in the Federal and State courts of Iowa, the Iowa Supreme Court, and the Federal Courts of Appeals. Note that this article does not necessarily represent the opinions or positions of Brown Winick Law Firm and only represents the speculation and opinions of the author. You want to file something with the EPA. But in order to file it, you must first be registered with the EPA. Can’t figure out how to get registered? No problem, enter your user name and password on the form and you will be allowed to see the instructions! What? You don’t have a user name and password already because you are not registered yet? Welcome to the EPA’s new CDX Self-Disclosure Policy website. Many companies have utilized the EPA’s self-disclosure policy. This policy encourages companies to voluntarily self-disclose violations that they find during audits and under certain other circumstances. The system has worked for many years. However, on December 9, 2015, the EPA scrapped the old program and replaced it with a centralized web-based “eDisclosure” portal to “automatically process self-disclosed civil violations of environmental law.” If attorneys and compliance professionals are not aware of this change and mail in their usual disclosure then they run a risk of missing the short 21-day disclosure deadline and being subject to the full weight of EPA’s penalty fury. Require everyone to register through the EPA’s CDX Central Data Exchange. This is a classic federal system with the usual security protocols that make it take 10 times longer to do anything — great if you are getting paid by the government, but terrible if you are billing your poor client by the hour. Require a user name in order to begin the registration. It turns out that you can pick any name you want, though “EPASucks” was already taken. My compliant is that the website does not tell you that you can pick your own name. I had to lose almost one day waiting for the help desk to call me back with the answer to that question. Require that your identity be verified by Lexis/Nexis. I flunked this test on the first try, so I started all over again and for some reason was verified. If you cannot be verified, then you have to fill out a form where you promise the EPA that you are who you say you are and then mail it in. If that is your situation, note that you can continue with the self-disclosure process. You will have to keep in mind that you need to get your identify verified before the next deadline, which is compliance. Have the shortest inactivity time out clock I’ve ever seen (five minutes). Here I am, trying to fill out a long complicated form, and everytime I went back to the form to click another box I found that the timer had expired and all of my previous work was gone! That is extremely frustrating. I’m sure that this is a feature of the CDX system that EPA won’t change. But I should not have to click on the site every five minutes in order to keep it active. There is no way to add any information regarding the alleged violation when you first file. Only after you file your disclosure are you allowed to provide some information regarding the circumstances. There is no way to upload any documents when you first file the disclosure. Their website says you can, but the option did not appear until after the disclosure is made. 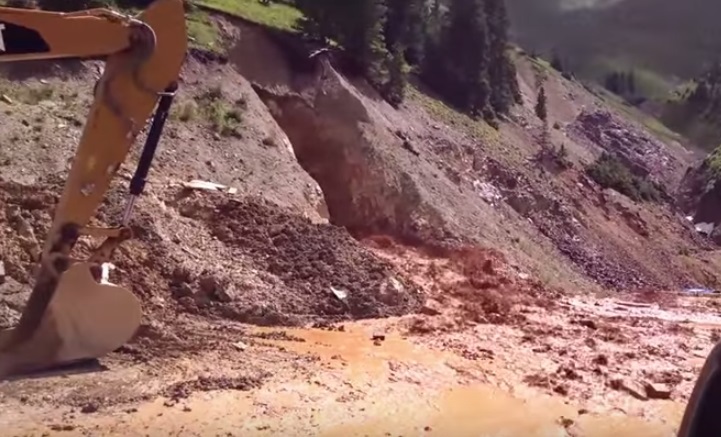 An interesting video montage of the Animas River disaster. The first half is the EPA’s explanation of how they created this problem. The second half is the actual creation of the disaster filmed while it happened. Example of EPA test results. The frequently asked questions page posted by the EPA downplays any real effect on the river or aquatic life. 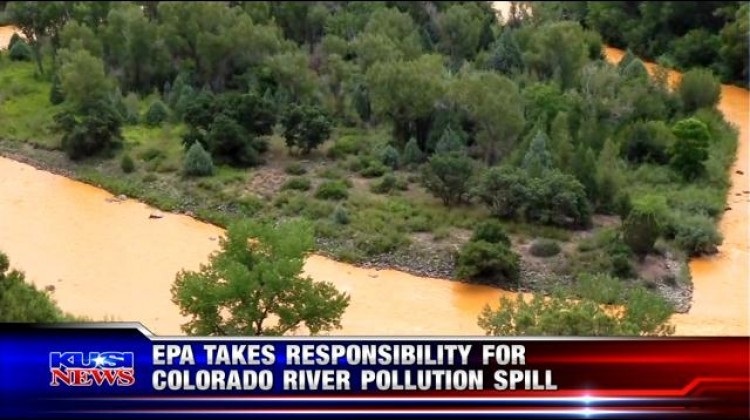 Of course, if this yellow water was safe, then why was the EPA poking around the mine to begin with? There are two additional issues that the EPA needs to address. First, there is the claim that the EPA waited a whole day before notifying downstream residents that the water was contaminated. If true, that is unforgivable. Second, there is the question of financial responsibility. It is unlikely that the contractor that is reported as having actually caused the spill (Environmental Restoration, L.L.C. by some accounts) has enough insurance coverage to cover this claim. Some reports, probably sensationalist, peg the cleanup in the billions. I have information to lead me to believe that the contractor has at most $7M in total coverage. That may seem like a lot, but when the EPA conducts a removal action, its costs are usually astronomical, and several times higher than what a typical contractor would charge. I know that if one of my clients caused a spill of this magnitude the Justice Department would be all over this with indictments and subpoenas. Unless the individual states take action, I doubt that we will see the same level of concern or urgency by the Federal government that I see displayed when my own clients re accused of violating a law or permit. Who is to blame here? I have personally watched the EPA work with this particular contractor on a cleanup and I can assure you that Environmental Restoration L.L.C. does not do anything that the EPA project manager does not tell them to do. The Clean Air Act that we know today was passed in 1970 during the Nixon administration. Since that time, the EPA has been hard at work passing regulations aimed at cleaning the nation’s air. Its efforts have been extremely successful. I recall living in the D.C. area in the early 1970s before most of those regulations really took effect and the air was so polluted that on some days you could see the smog just looking across the street. I can’t describe what it was like as a kid in a car while going through Newark in the 60s on the elevated turnpike and going straight through huge clouds of sulfur dioxide and other hazardous air pollutants being belched by smokestacks next to the turnpike. I doubt that kids growing up today have any understanding how clean the air is now. One problem, however, is that the Clean Air Act really does not have any brakes. The EPA continues to look for any potential effect on human health and passes regulations requiring that the emissions be eliminated, in some cases, even though the cost far outweighs the benefits. 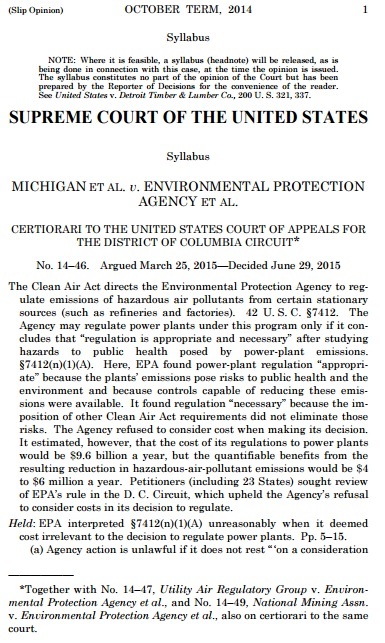 Today the United States Supreme Court dealt a rather stunning blow to the EPA’s rulemaking authority in its June 29, 2014 decision in Michigan v. EPA. At issue was whether the EPA had to consider the economic impact of its hazardous air pollutants (“HAP”) emission standard for mercury emitted by electric power plants. The EPA regulates HAPs for stationary sources. A source that emits more than 10 tons of a single HAP or 25 tons of HAPs in combination is a major source. Power plants are also required to meet additional requirements. One of those requirements directed the EPA to perform a study of the hazards to the public health reasonably anticipated to occur as a result of power plant emissions of HAPs. The rule at 42 USC § 7412(n)(1)(A) also provides that if the EPA finds that regulation is “appropriate and necessary” after considering the results of the study then it shall regulate the power plants. Justice Scalia focused on the “appropriate and necessary” language and held that this means that the EPA must consider the economic impact before imposing certain new emission standards on power plants. The EPA’s own regulatory impact analysis estimated that the cost of the new standard would be about $9.6 billion per year. I know that this is a laughably ridiculous underestimation of the actual economic costs. Even so, the benefit was estimated by the EPA to be no more than $6 million per year. Again, this is probably a gross overestimate by the EPA. Justice Scalia noted that using these figures the costs exceeded the benefits by at least 1,600 times. A majority of the court agreed with Justice Scalia’s conclusion that the EPA is directed to engage in some sort of economic analysis before imposing the new standard on power plants. What is the importance of the case? First, it may have application to other areas of air pollution regulation outside of HAPs for power plants. The majority opinion’s broad conclusion that the “appropriate and necessary” language sends a clear signal that attorneys should consider the fact that the Supreme Court is willing to read into the Clean Air Act requirements that the EPA act reasonably. Second, the decision was reached after the EPA published the rule in 2012 after notice and comment. Challenging an EPA rule is a complicated process that actually starts at the Circuit Court level. It can be difficult to raise a challenge after the appeal period has expired. In other words, this law may have more prospective effect on the EPA than retroactive effect. Third, it may be too late. Utilities have already shuttered plants based, in part, on the difficulty in retrofitting those plants with the necessary emission controls for mercury.